The upcoming 2016-17 season will be the first time Derrick Rose plays for an NBA team other than his hometown Chicago Bulls. Over the summer, the Bulls and Knicks made a trade that will put Rose alongside All-Star Carmelo Anthony and rising star Kristaps Porzingis. No one knows how Rose will perform as a Knick this season but we can say he’ll be properly fitted on his feet with the D Rose 7 Primeknit. But don’t think for a second that Rose will be abandoning his Chi roots in favor of New York. For his seventh iteration of the D Rose, the launch colorway was be a solar red colorway that isn’t supposed to mimic the red of the Big Apple, but a nod to the Great Chicago Fire of 1871 that consumed more than 3 square miles of the city. The tragedy left over 100,000 residents homeless, but it also stoked a spirit of rebuilding, a metaphor for Rose’s fresh start in New York. Adidas wisely kept it basic with the outsole tread, going with a pliable rubber with a modified herringbone pattern. The bane of all recreational ballers is playing on dusty courts, slipping and sliding while having to fastidiously wipe the dust off the sole every other play. Ballers can rejoice because the Rose 7 traction pattern works fantastic on all courts and requires nearly no wiping at all (of course the OCD in many of us will have us continue doing so anyway). 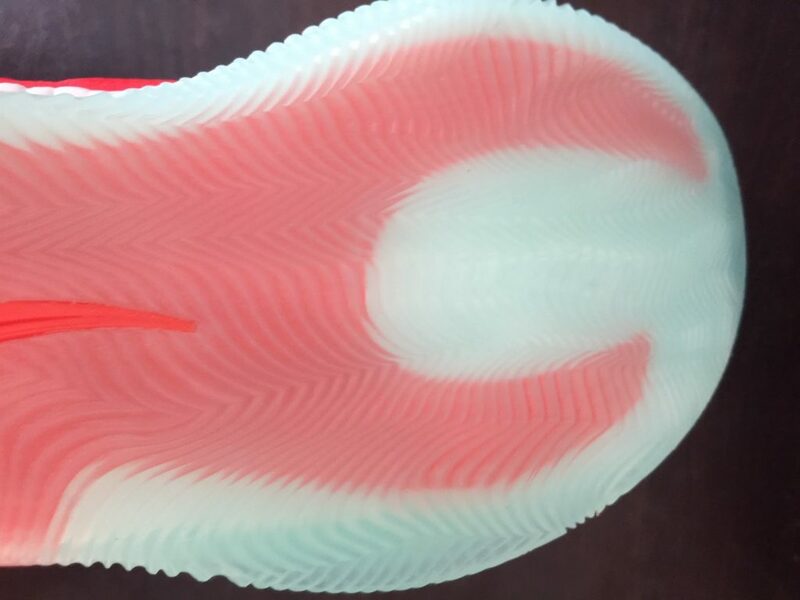 But being a translucent outsole, it does require more wiping than the solid outsole option because it picks up more dust. Getting back to the herringbone, we can say the pattern is very tight and, offering plenty of court contact. In addition, the grooves are deep, which means the D Rose 7 should be pretty durable, even when used outdoors. The Rose 7 features full-length Boost and feels slightly firmer than last year’s Rose 6. 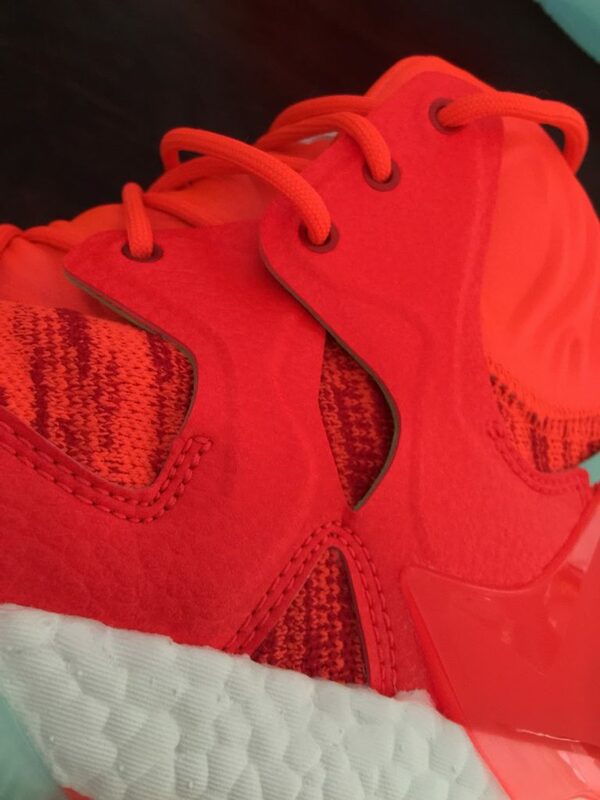 Making the Boost full length gives the shoe a smoother and more consistent transition from heel to toe. 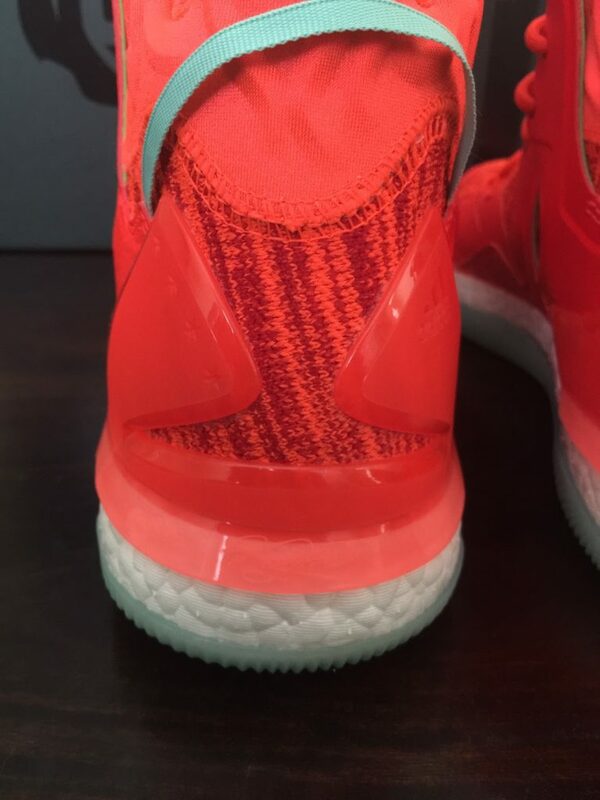 Adidas gave the Rose 7 a significant bit of toe drop as the Boost cushioning thins out from heel to toe. There isn’t a lot of spring in the forefoot because Adidas replaced the cloth strobel used on the Rose 6 and replaced it with a firmer board. If you want a more cushioning in the forefoot, I suggest replacing the thin stock insole with a thicker one. In the heel, there is plenty of impact absorption on heel landings. All in all, it’s pillowy Boost, but don’t expect it to feel like your Ultra Boosts. Sizing can be tricky when it comes to adidas, but we’re glad to say that the Rose 7 runs true to size even for wide-footers. 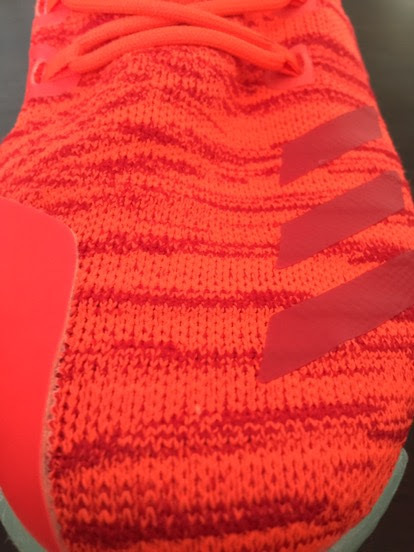 There is no movement side to side as the Primeknit upper hugs the foot like a sock. There is a little dead-space bubble that forms in front of the bottom eyelet since there isn’t a traditional full length tongue but it doesn’t affect the fit, it just looks odd. Heel and mid-foot lockdown is amazing. The D Rose 7 uses synthetic leather straps to pull the foot back and down while contouring the inner ankle collar. Together, the end result is a great one-to-one fit. 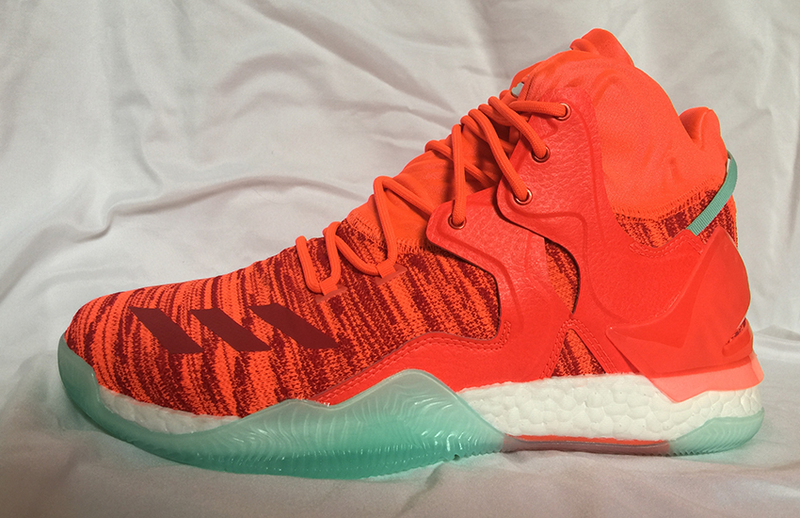 Adidas has two different materials for the Rose 7, Primeknit or mesh. 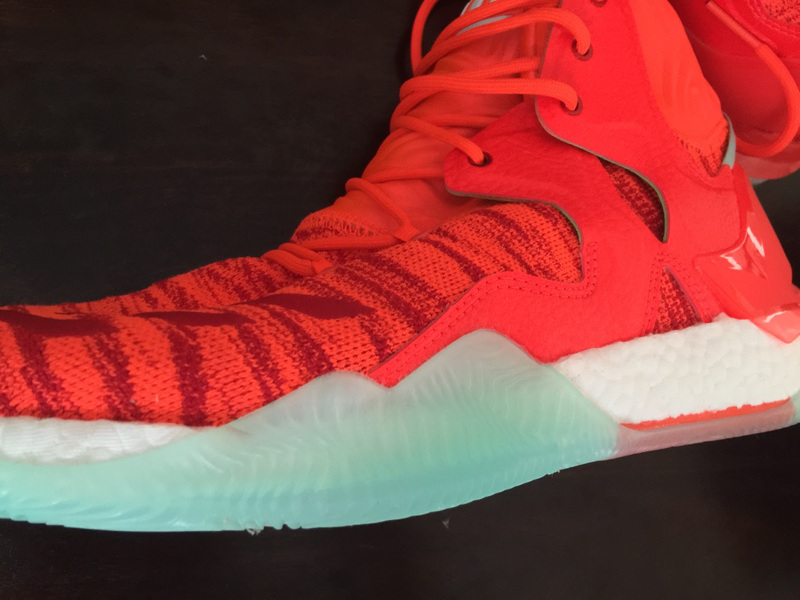 This review is based on the Primeknit version which costs $20 more. Some players have stayed away from knit uppers due to stretching on hard cuts and stops. However, adidas solved this issue by smartly engineering the Rose 7 with a tighter weave and placing nylon strands underneath the upper to serve as a skeleton for the shoe. This allows the Primeknit to fit and react naturally while providing support and strength at the same time. The D Rose line has always struck a nice balance between support and flexibility and the Rose 7 is no different. The majority of modern mid to high cut shoes are ultra flexible and are primarily cut so for aesthetics and proprioception purposes. The Rose 7, on the other hand, actually provides support with a firmer yet comfortable ankle collar and external heel counter. This is obviously important for Derrick Rose, who has regularly reinforced his ankles with adidas Speedwrap ankle braces throughout his career. No shoe will stop an ankle roll but the Rose 7 does manage to slow the roll. In addition to its excellent support, the Rose is very stable thanks to a large torsional shank as well a very long outrigger at the forefoot. Rose’s game involves a lot of quick changes in direction so it only makes sense that his shoes provide excellent lateral containment. 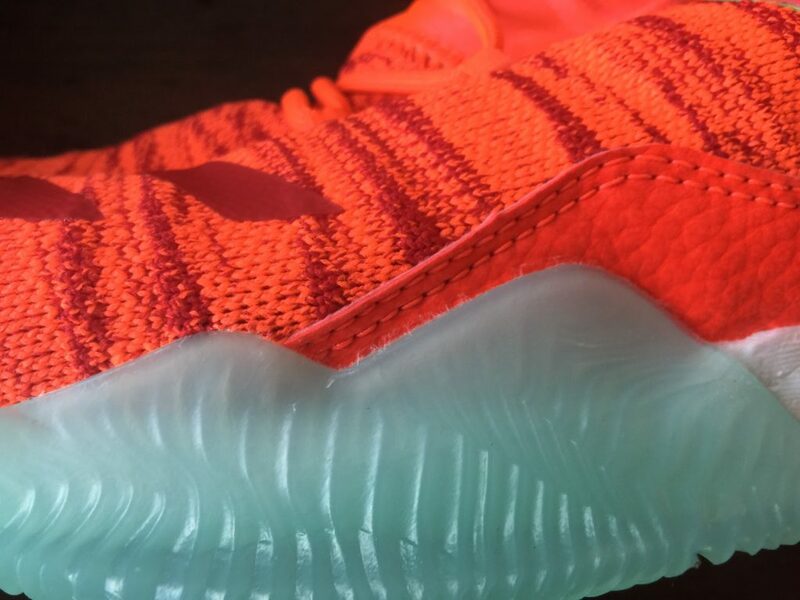 Like with all of adidas’ basketball offerings featuring Boost, a roll cage at the forefoot gives the shoe more integrity and preventing rollovers on the soft Boost. As mentioned previously the Primeknit upper is reinforced with nylon strands, allowing the upper to remain flexible yet strong during lateral stops. Best for: Guards who like extra protection in a shoe. The 2016 season might be a new start for D Rose but adidas picked up where it left off last year and continues to deliver some exceptional performance shoes at a relatively modest $140 for the mesh version and $160 for the Primeknit version. The shoe offers fantastic traction, great cushioning and fit in a stable and supportive shoe just makes the D Rose 7 an All-Star performer.